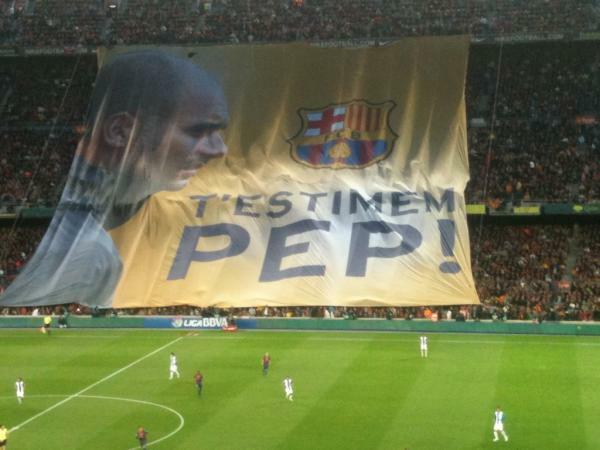 Pep Guardiola’s final home game in charge of Barcelona welcomed the visit of Pochettino’s Espanyol side to Camp Nou. What turned out to be a very comfortable win for Barcelona was played, with a few exceptions, at a generally low tempo throughout especially the first half. The game had the feel of an end of season encounter with nothing at stake. The highlights, as ever, arrived via Messi. Following the clasico defeat, Barcelona have scored 11 goals and conceded just 1 in their two games against Rayo Vallecano and Malaga, each game seeing a few changes in personnel. Pinto continued in goal ahead of Victor Valdes owing to a combination of Valdes wishing to win the Zamora Award and also due to Pinto’s appearance in the forthcoming Copa del Rey final, the game provided much needed match practice. Montoya made his second start at right back in the last three games and there were also starting places for Thiago, Keita and Pedro. Espanyol entered the game with their season more or less over. Similar to last season, they began brightly and harboured hopes of European football before declining sharply in the new year. Never in any danger of relegation this season, los periquito’s recent form of just one win in eight games effectively killed off any thoughts of entertaining European football at the Estadi Cornella-El Prat next season. Pochettino made just one change from the side which lost away to Granada midweek, with Moreno replacing Romaric. This necessitated a reshuffle with Forlin moved out to right back and Javi Lopez starting in a defensive midfield position. 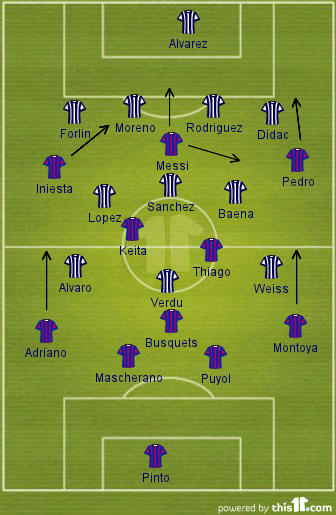 Espanyol started the game with their normal high line and aggressive, pressing style, seeking to disrupt Barcelona and prevent them from establishing any sort of rhythm. They probably started a little too aggressively, conceding four fouls in the opening five minutes with Forlin cautioned for pulling back Iniesta. As Barcelona began to exert a little more influence over proceedings mainly via Iniesta on the left drifting inward, and Forlin at right back hindered by his early caution, Messi won and scored from a free kick after 11 minutes. To some extent, this killed the game with the tempo remaining particularly flat for the remainder of the half only enlivened by free kicks from Iniesta and Messi which went close. Espanyol retained a narrow 4-3-3 shape with a high defensive line and little space between the lines due to their generally compact shape. There was space wide with Espanyol holding a narrow line across the width of their penalty area but this was never really exploited by Barcelona. Iniesta preferring to move inside and Pedro still searching for form. When Espanyol attacked, all their creative play came via Verdu operating centrally and Weiss coming inside form the right. With both sides happy to press high and push their defensive line up, there was ample space in behind the respective defences yet neither team took advantage of this in the first half. Espanyol continued to press high, making life awkward for Barcelona when trying to pass out from defence. Espanyol never had the opportunity to put real pressure on Pinto when he had the ball at his feet. Barcelona will always seek to play the ball out from defence even when under pressure and the goalkeeper becomes an important link in the chain, providing angles for a backpass and switching the play across the pitch. Pinto is noticeably uncomfortable with the ball at his feet and his range of passing is substantially less than Valdes. Considering their aggressive pressing style, this should have been an area for Espanyol to attack yet it never materialised. With five cautions, Espanyol continued their assault on the fair play league and are now second behind Valencia in terms of the number of yellow and red cards they have accumulated this season. There is nothing unusual statistically about the number of tackles they make per game or the number of fouls they concede per game but their yellow card count is very high. Due to their high defensive line and tendency to press, perhaps they commit more cynical fouls than others to help the team recover their shape? The second Barcelona goal arrived via a debatable penalty for handball. There was considerable protest from Espanyol players leading to three cautions being received. Aggrieved by the decision, Espanyol began to lose their shape. Trailing 2-0, Pochettino replaced Alvaro with Coutinho leaving Espanyol with no recognised striker on the pitch for the remaining 27 minutes of the game. There were options on the bench in the shape of Uche and Pandiani but neither is going to provide the level of mobility and fluidity that Pochettino was clearly seeking from his team in an attacking sense. Messi’s hat trick took advantage of Espanyol sending a number of players forward for a corner. With the corner successfully defended, Thiago floated a ball over the Espanyol defence for Messi to run onto to. This was the first real exploitation of the Espanyol high line. Three touches later it was 3-0. Barcelona and Messi’s fourth followed shortly with another penalty kick. The Espanyol defensive line became ragged as the game drew to a conclusion with the back four now stretched across a wider area and the compactness of the team now gone. This led directly to Messi’s late chance from Thiago’s threaded pass but overall, the defensive lines of both sides were maintained well, supported by the twelve offside decisions in the game. Espanyol have caused Barcelona some difficult moments in recent meetings but there was never any sense that a shock was likely to happen here. A very routine win for Barcelona in Guardiola’s last home match in charge.